Calsequestrin-2, 20-399aa, Human, 01-1799-2 | ARP American Research Products, Inc.
Calsequestrin2 is a calcium-binding protein of the sarcoplasmic reticulum. The protein helps hold calcium in the cisterna of the sarcoplasmic reticulum after a muscle contraction, even though the concentration of calcium in the sarcoplasmic reticulum is much higher than in the cytosol. It also helps sarcoplasmic reticulum store an amazing amount of calcium ions. Recombinant Calsequestrin2 protein was expressed in E.coli and purified by using conventional chromatography techniques. 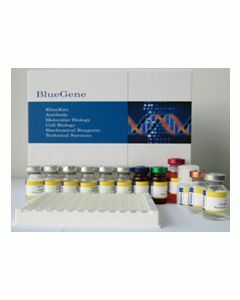 PDIB2, CASQ2, Calsequestrin 2 (cardiac muscle), Calsequestrin 2 fast twitch cardiac muscle, Calsequestrin cardiac muscle isoform, Calsequestrin fast twitch cardiac muscle, Calsequestrin2, Cardiac calsequestrin 2, CASQ 2, ESTM52, FLJ26321, FLJ93514, PDIB2. Wang S,, et al. (1998) Nat. Struct. Biol.. 5(6):476-83. Lahat H, et al. (2001) Am J Hum Genet. 69(6):1378-84.